Weight: 0.54 ct; size: 10.10 | 4.11 | 2.32 mm; shape: octagon; colour: medium orange; very slightly brownish; clarity: eye clean; cut: excellent; treatment: none. Very clean specimen; design ‘Octaelongatis 2’, excellent cut by Tan Pen. 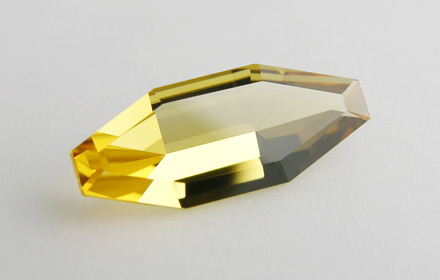 A golden yellow variety of beryl.